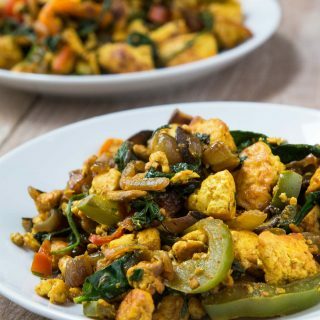 This Vegan Curried Tofu Scramble Recipe comes together in just 25 minutes. It’s packed with some of my favorite veggies and seasonings and perfect for breakfast, lunch, and even dinner. Heat 2 teasp avocado oil in a large non-stick pan on medium heat. Add the minced garlic and saute for ~30 seconds. Add the red onions, bell peppers, and mushrooms. Saute on medium-high heat, mixing frequently, until they just start to char slightly. When done, the veggies should still have a slight crunch to them. While the veggies are cooking, you can start to prepare the tofu by draining out the water. Add 1 teasp Spicemode Curry Seasoning and cook for another 30 seconds. Set aside in a bowl. Using a wet napkin, quickly wipe down the non-stick pan while it's still warm. Cut the block of tofu in half. Place each half in 2 clean paper towels one at a time and gently press/squeeze to remove excess stored liquid (without completely breaking up the tofu). Heat 2 teasp avocado oil in the same non-stick pan on medium-high heat. Using your fingers, break apart the tofu into the pan so you get a nice scramble with lots of chunks. Mix and turn frequently until all the water is burned off, the tofu starts to get texture, and is lightly golden brown. Add 1 teasp Spicemode Curry Seasoning and mix once more. Once the tofu is done, immediately add in the sauteed veggies, mixed greens, 1 teasp Spicemode Curry Seasoning, and 1/2 teasp salt. Combine and cook for another 1-2 minutes until all the greens have cooked down. Season with additional salt and/or Spicemode Curry Seasoning if needed. To Serve: Enjoy the curried tofu scramble hot as is, pair it with a slice of toast, or make a grilled burrito using the curried tofu scramble and some avocado as the filling served with your favorite hot sauce! For the mixed greens, you can use any of your favorites. I found that the baby greens work best in this dish so that you don't have to chop them down in size. I used Earthbound Farms Power Green blend.